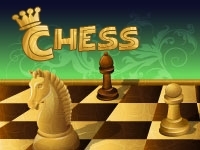 Chess is the classic game of strategy and tactics. Played head-to-head each player has 16 pieces of 6 distinct types, capable of different moves. The game is played on an 8x8 checkerboard. The object of the game is to capture your opponents "King". The goal of chess is to put your opponent in checkmate. Your opponents King is in check when it can be taken by one of your pieces. The King is checkmated when is cannot escape by moving to a safe square, by attacking an opponents piece, or by being protected by placing a piece between the King and the threat. Moving a piece to an empty square. Moving a piece to a square occupied by an enemy piece to take it from the board. Chess is a game played by two, on checkered board with 64 squares, 32 white, and 32 black. The vertical columns of squares each have a letter from A to H from left to right (from whites perspective). The horizontal rows of boxes are numbered from 1 to 8 -starting at the White's side. The bottom right square must always be white. In chess there are six pieces that all move distinctly. Pawns advance straight ahead. Moving one square at a time - excepting their first move - when they can move two squares. Pawns capture the opponent's pieces diagonally in front of them and can never move backwards. The Rook moves in straight lines along the rows or columns any number of squares. Rooks may move right, left, forwards or backwards. Jumps by a moving one square horizontally or vertically and one square 'forwards' diagonally. forming an 'L' shaped move. It may pass over other pieces. Moves diagonally any number of squares. One of your two bishops will be on a white square and the other on a black square, they will never move to a square of the opposite color. The Queen may move horizontally, vertically or diagonally any number of squares, forwards or backwards. This makes her the most powerful piece on the board, controlling a maximum of 27 squares. The king may move a single square in any direction. The King has a special defensive move, that of Castling. There is "Kingside Castling" which involves moving the King two squares to his right and "Queenside Castling" moving two squares to his left. In ether case, The King is moved two squares towards The Rook (castle), which is then jumped over the King to stand on the 'inside'. Castling is the only move in chess where The King can move more than one square at a time and the only time two pieces on the same side move at once. The King and Rook must both be in their original squares and not have moved. The squares between The King and Rook must be empty. The King cannot be in check and must not be in check in any of the squares it passes through during the move. When a pawn reaches the last row (the opponents first row) he may be promoted to any other type of piece except a King. When a pawn has reached the 4th row for Black or 5th row for White, It can take an enemy Pawn which has moved forward two squares. Example: A White Pawn advances H2 to H4. Black may move G4 to H3 performing a movement diagonally behind the opponents Pawn, taking the White Pawn. The "en passant" must be made immediately in response to the pressure of the opposing pawn. This rule prevents two enemy pieces passing without ever having had the opportunity to take one another at least once in the game. It allows you take take a Pawn as if its first move had only been one square. Stalemate: when it is his turn to play, a player is not in check - but has no legal move available to him - the game is a stalemate regardless of the number of pieces left on the board. Insufficient Material: You can not checkmate with only a King, or King + Knight, King + Bishop or King + 2 Knights against King. Repeat position 3 times: It is a draw if the same position occurs 3 times during the game. 50 moves rule: The game is a draw if 50 moves take place without a Pawn moved or a piece captured. The game is also a draw if either player offers a draw, and the opponent agrees. 1. Opening: each side must try to develop a strong position quickly, placing pieces on squares where they can have maximum impact and synergy between them. 2. The mid-game: here players try to make attacking combinations to win pieces, or follow a defensive game plan to stifle the enemy and gain a strategic advantage. 3. The end-game: when few pieces remain, The situation is generally more clear: the side that took the advantage and gained most pieces, must convert into a win, while the depleted side must try to force a draw. It is generally pure technique. avoid your moving your queen beyond the second row. The queen and rooks are high value pieces that are prime targets early in the game for opposing attacks. It is better to them to support rather than attack, although if you see a loophole to exploit, the queen can quickly infiltrate an inexperienced opponent and can cause major damage. Against beginners you can often just take the pieces you are offered on a plate. But once the level rises, you must be a little more imaginative and make combinations of several moves in which you seek to exchange material for your benefit. Do not give your rook to capture the opponent's bishop ! By contrast, give without hesitation, a bishop or knight to capture a rook. In general, do not give up any piece, not even a pawn without obvious compensation. When two opponents are of good standard, it is very difficult to surprise the other on a combination. Each will attempt to accrue some small strategic advantages that will eventually help to crack the other's position. This is where the real chess game begins. - Pawn structure: the pawns are the backbone of your position, pawns are strongest when protected in two adjacent columns and one behind the other. Avoid doubled pawns (one directly behind the other following a capture). Definitely avoid doubled isolated pawns! - "Bad Bishop": A bishop is weakened by the presence of his own blocked pawns on the squares of the same color, because they reduce movement. Especially since often the opponent will then have the "good bishop"
- Initiative: Do not waste time playing useless moves, give real meaning to each of your moves (following a plan), try to put pressure on the opponent every time by creating threats. - Try to place a rook on the 7th row any pieces in their original positions will be difficult to defend. Avoid letting him do it to you! - Pay attention to check: You're in strong position, for example King against King + queen, you should win easily but be careful - if you opponent is not in check not in check but has no legal moves the game is a stalemate and ends as a draw despite your overwhelming material superiority. - Be sure to retain enough material to checkmate: only King + Pawn versus king can win (usually), while King + Knight versus King, King + bishop versus king, or even 2 Knights are a draw.